Mary MacKillop was an educator, a pioneer and a leader, someone who had compassion for others regardless of their situation or race. Galvanised by her belief in the value of education as the foundation for a fulfilling life, Mary’s motto was ‘never see a need without doing something about it’. This led her to minister in many different ways to those who were poor and pushed to the margins. Formerly Mary MacKillop International, the Mary MacKillop Foundation and the Josephite Foundation, we are committed to continuing the works of the Sisters of Saint Joseph, with the utmost respect for our great past and we look to the future for transformation and change, in the spirit of Saint Mary MacKillop. Guided by the Gospel, we stand with the poor and the marginalised so they can realise their potential and participate fully in the community. Through access to education and learning of practical life skills, we seek to transform lives. Did you know some of these details about Mary’s life, which reinforce her strength of character? 1. Her parents were Scottish immigrants who settled in Melbourne and Mary was born there on 15 January, 1842. Money worries were part of Mary’s life and the ‘boom and bust’ gold days saw the MacKillops suffer continual financial instability. 2. From her teens to mid-twenties Mary supported the family, working in a stationery business and then as a school teacher and governess, before taking the first of many courageous steps in her life at the age of 24. 3. Mary wanted to serve the poor, particularly educating the children who lived in the bush. She opened a school in a stable on 19 March 1866, wearing a simple black dress as a sign of a radical life change. The first school set the pattern for many to come – it was for the children of the working class, providing a basic but thorough education, aiming to make children independent, employable and well-grounded. 4. Other young women joined Mary MacKillop and worked to establish places of refuge and rehabilitation for people in need, as well as the schools. Mary developed a Rule for the Sisters of St Joseph, as they became known, dedicated to meeting the material and spiritual needs of struggling people. 5. 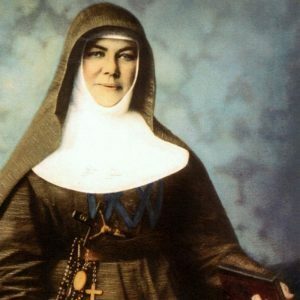 Mary MacKillop had a radical vision of the way the Order of the Sisters should be structured – she didn’t want the Order to be subject to direction by the Bishops of particular dioceses, and every Sister was to help with the work, regardless of background. 6. In response to Mary’s stand on the structure of the Order of the Sisters of Saint Joseph, Mary came into direct conflict with the Bishop of Adelaide. She was excommunicated on 22 September 1871, which was technically removed on 23 February 1872, although conflict around the principle of the matter continued. 7. Mary decided to take her cause to the Pope in Rome – the highest authority in the Catholic Church. Aged just 31 and as a professed Sister of St Joseph, Mary went to Rome dressed as a widow, and gained an audience with Pope Pius IX and a hearing from the Vatican authorities, receiving approval of her Rule within a year. 8. Returning to Australia, Mary went to Queensland establishing schools and communities but her troubles were not over. Mary was deposed as Superior General in 1885 on technical grounds but was later re-elected by the Sisters. 9. Mary MacKillop’s attitude was always of forgiveness and respect. Her many letters are evidence of her vision, courage and leadership. 10. After suffering a stroke, Mary lived at North Sydney in Alma Cottage, her health deteriorating but her keen mind alert to the end. Mary died peacefully on 8 August 1909. You can read a range of quality, factual information about Mary MacKillop here. Mary MacKillop Today is inspired by the work and ethos of Mary MacKillop, and carries on Mary’s legacy to continue helping people in need, with the aim of creating more connected, stronger communities. Find out more about how we meet community need and support Indigenous students through tertiary education scholarships here and all our projects and programs here. To make a once-off or regular donation of support, click here.